The AMS DM2-20 tape phase simulator is the result of long and extensive research into the requirements and needs of the recording industry, for accurate simulation of tape phasing in real time. Unlike other units of this kind, which solely mix the delayed signal with the original, the DM2-20 uses two independent delay lines to allow true ‘over the top‘ tape phase simulation. This can be either manually or automatically swept, coloured LEDs indicating phase position. Additional phase switching allows cancellation rather than addition of the delayed signals, giving the ‘tunnelling or cardboard tube‘ effect with total cancellation at the equal delay point. ‘Flanging’ is also possible in the single modulation mode if the ‘manual phase‘ control is set such that one delay is always longer than the other, and modulation is applied to the longer delay. This is achieved by rotating the ‘manual phase‘ control knob to the 2 o’clock position and applying modulation. The AMS DM2-20 also incorporates an extremely effective method of simulating rotating speakers thus eliminating the need for these large units in the studio and also avoiding the necessity of taking these, not only bulky, but also very heavy speakers on the road. 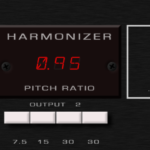 Included in the unit (as standard) is a stereo output that gives a solid spatial sound and a ramp generator to simulate the mechanical characteristics of tone cabinets. The AMS DM2-20 can also be very effectively used in it’s stereo mode for psyco-acoustic image shifting, or auto-panning. The good signal to noise ratio of the AMS DM2-20 is achieved by careful design and not by the use of compression/expansion techniques employed by many similar products; the resulting sound is, therefore, exceptionally clean.